Supporting the transition towards a circular economy is one of the policy priorities of the EU in line with the Europe 2020 Strategy for smart, sustainable and inclusive growth and its Flagship Initiative "A Resource-Efficient Europe". Enhancing the synergies between H2020 and ESIF has been emphasized in the 2014-2020 EU MFF as a way to leverage investment for policy priorities and increase the result-orientation of the EU budget. However, many challenges and open questions still remain on how this can be achieved in practice. Regions are key players in the transition to a circular economy and can together create new circular economy value chains with critical mass. However, knowledge of each other's strengths and the available resources and services is often limited. Developing joint strategies, built on complementarities and respective strengths, can therefore be valuable for better realising their individual and combined potential. The action will leverage on traditional and emerging industrial sectors in EU regions, both at process and manufacturing industry levels, and will act as a driver (also for the less performing ones) to support the emergence of new actors in the regional economies leading to new or redesigned value chains in support to circular economy. The concept is to systemically investigate the possible connections and complementarities between different sectors and value chains in European Regions. The implementation of the action is based on 4 different steps: the first one is related to the identification of local potential value chains in each region and the second one deals with cross regional synergies between different value chains. 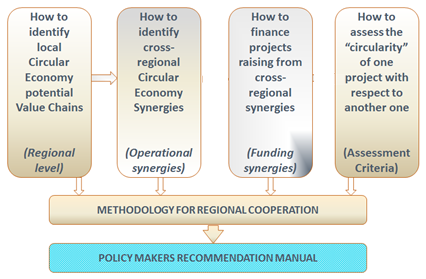 Such synergies, once identified, lead to different cross-regional projects: the third step deals with the issue of financing them through funding synergies. 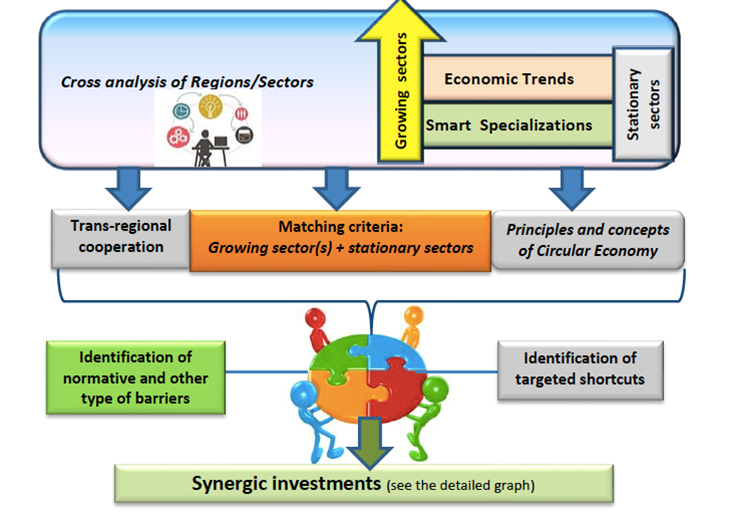 SCREEN aims to develop a replicable systemic approach towards the transition to circular economy in EU regions within the context of their Smart Specialization Strategies, through the identification and implementation of operational synergies between R&I investments from H2020 ESIF, thus contributing to novel future eco-innovative and horizontal business models across different value chains. Maximizing the H2020 impact by supporting "circular" entrepreneurial initiatives based on the exploitation of H2020 projects' results. SCREEN will develop a common agreed approach to support a transition to a circular economy and to enhance existing smart specialisation strategies of the involved regions. The project will also develop some policy support advisory services to enable regions to invest EU funds in trans-national value chain that will be identified and ranked by adopting common criteria. Thanks to the high transferability of the SCREEN results, several current barriers to trans-national synergic approach will be bridged, thus leading to faster and better planned use of EU funds, according to the objectives and targets of the European Union.